Your video of the planet earth rotating in space. What city is located at 30 degrees north and 31 degrees east? Numerous people have been visiting my web site seeking this information. They typically go to one of my dynamic latitude longitude finder pages and then drag the map until the wanted lat-long coordinates are showing. They then note the name of the town or city located there. This page therefore uses a free non-interactive static maps avaliable from Open Street Map. Their important attribution and link to their website is in the lower edge of the image. but their maps do not show this Tlainepantla city. If you can help Open Street Map by adding your own local details it will be much appreciated. This location is Cairo city in Egypt. 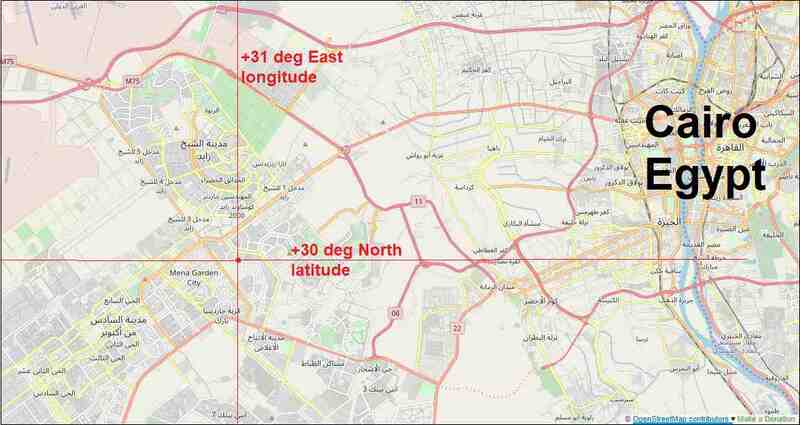 The 'rounded' number coordinates of 30 degrees north and 31 degrees east do not relate to the exact centre of the city. I have put a facebook link at the top. Do you know anyone else who is searching with the same set of coordinates?